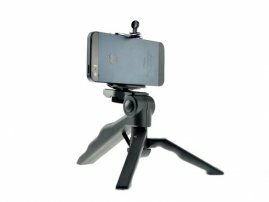 2-in-1 Handheld Monopod / Robust Selfie Tripod for iPhone / Smartphone / DC / SLR Camera / VideoCam : allputer.com - Accessories for all your Portable Electronics & Computers! The camera rig comes with a handle that is available with a wide platform. It has an ergonomic plastic molded handle. It features a platform made of rubber to prevent the camera from slipping and uses a standard 1/4 x 20 threaded stud to mount the camera. It also comes with a phone clip that you can use it with your camera phone for mobile-photography! With its unique design, you can have the handle open up and make a tripod instantly. You can also mount it to your camera tripod, it has a 1/4 x 20 threaded stud to mount on a professional camera tripod (or even other selfie stick). It is a tool that you cannot miss from your photography! - Comes with a pistol grip handle that no any other ordinary monopod / tripod can compare.